Emily Maynard is engaged for the fourth time — but will this one stick? 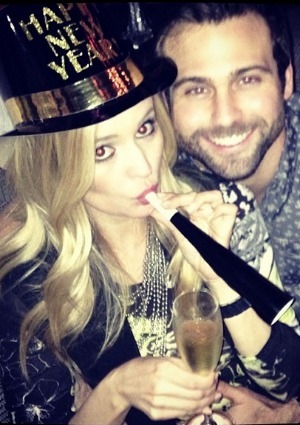 The fourth time might just be the charm for unlucky-in-love reality star Emily Maynard. The former The Bachelorette star announced she is engaged for the fourth time — and this time the lucky guy is neither a celebrity or a fellow reality star. Maynard’s boyfriend Tyler Johnson popped the question on New Year’s Eve, a source told E! News, after filling her house with flowers and candles, and asking the permission of not only her parents but of her daughter Ricki’s paternal grandparents, Rick and Linda Hendrick. Their son, race car driver Ricky Hendrick, was Maynard’s fiancé who was killed in a plane crash just days before Maynard found out she was pregnant at 18 years old. Apparently, everybody said yes — including Maynard herself. The course of true love has not run smoothly for Maynard. In addition to the death of Hendrick, she was briefly engaged to Brad Womack after winning The Bachelor and nabbed a proposal from Jef Holm on The Bachelorette only to see that relationship fall apart after mere months. A pal told E! that Maynard and Johnson met in church before she began her reality TV career but did not start dating until the dust began to settle on her most recent failed engagement.